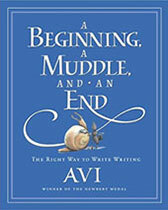 Avon the snail and Edward the ant are back for another funny—and philosophical—adventure. This time, Avon has decided he wants to be a writer, only to discover that writing is way more difficult than he ever imagined. He finally gets the word Something written down, but there's a problem: What to write next? Luckily, his friend Edward is there to advise.